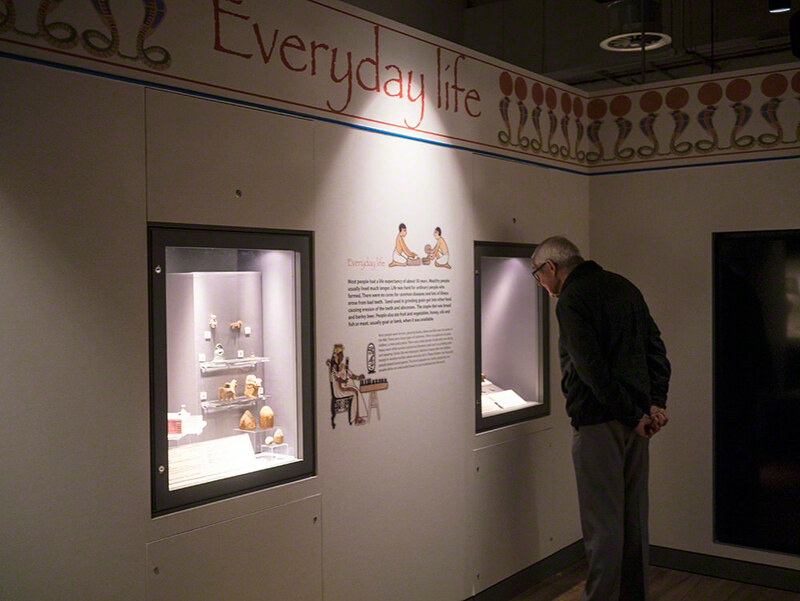 Friday, 24 October 2014: the opening of the new Egyptology gallery at The Atkinson in Southport, and a date which had been in my diary since it had been announced. Southport is only a 25-minute ride on the local Merseyrail train service for me, so with my three-year-old in tow (my girls are beautifully enthusiastic about museum visits!) and camera with a full charge and a clean memory card, we hopped on the train then made the three-minute walk from Southport station to the Atkinson. The Atkinson lives in a purpose-built 19th-century building in Lord Street, the main shopping street in Southport. Inside, it’s a well-managed mixture of 19th-century staircases and stained-glass panels alongside clean, modern partitions and furniture. 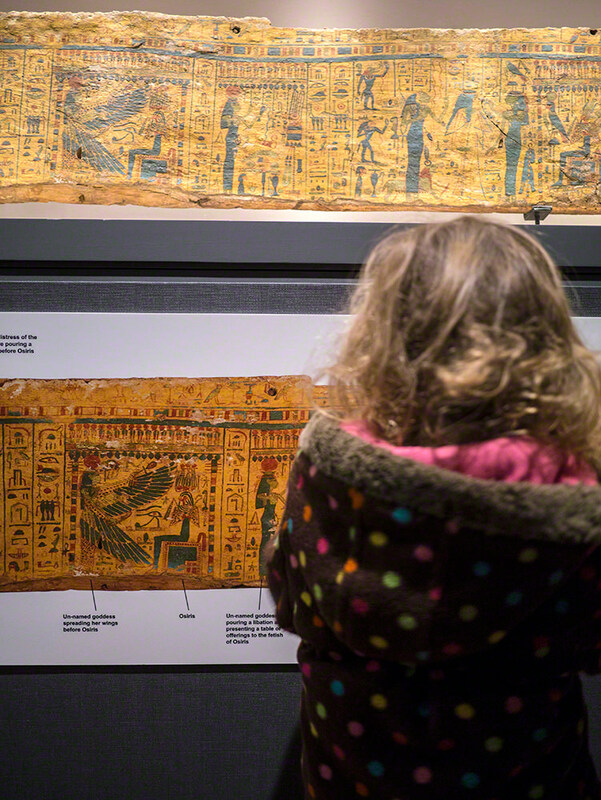 To get to the Egyptology gallery on the second floor, you can go up the grand staircase or, as we chose to, take the see-through lift (always exciting for the wee ones). 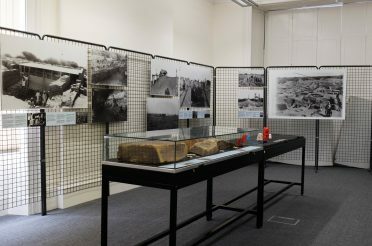 The gallery is right next to the lift, and the corridor leading to it has a lovely wall display (pictured above) showing you photos of the collection when it was previously on display in Bootle. 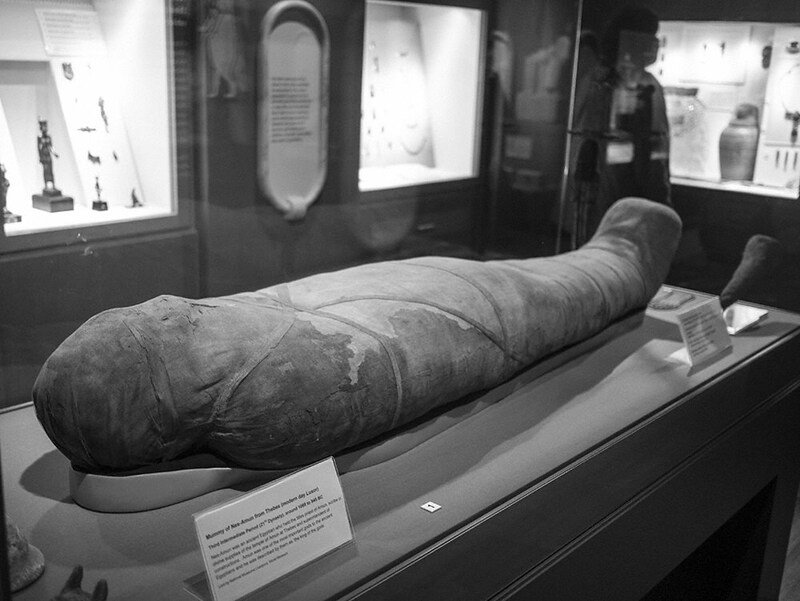 The collection was amassed during the late 19th century by Ann Goodison, an Egyptophile married to George Goodison, after whom Everton FC’s stadium is named. 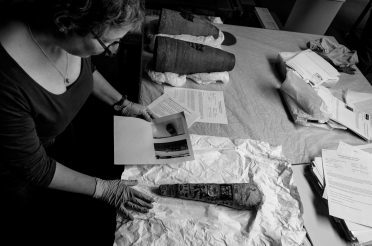 She displayed her collection of around 1,000 artefacts in her home in Waterloo, in the north of Liverpool, but when she died, her husband – not so enthusiastic about ancient Egypt – sold the collection on, where it found its way to Bootle museum (also on the north side of Liverpool). 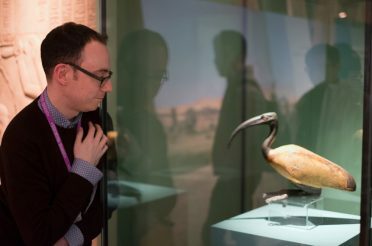 The collection was put into storage when Bootle museum shut down in 1974, until it found its new place as a permanent exhibition at the Atkinson this year. The gallery itself has been put together beautifully. The room – square in shape – is not particularly large, but the space has been used to great effect. 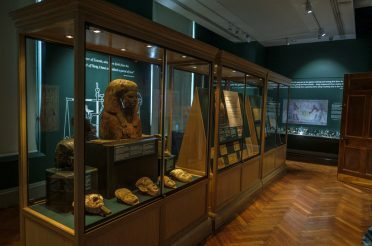 Partitioning has been used to create a corridor around the outside with an open area in the centre, and display cases embedded in the walls. 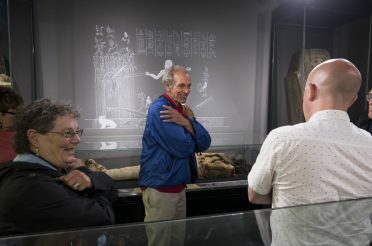 Charcoal-grey wall coverings and a lovely Egyptian cobra frieze gives it a real tomb-like feel. 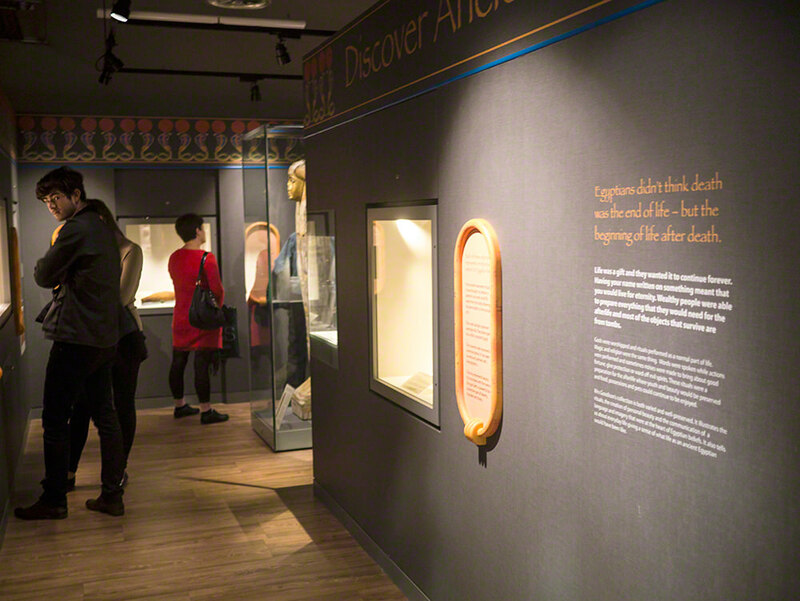 Although the room has low lighting, the display cases are well lit (a boon for those of us with cameras!). 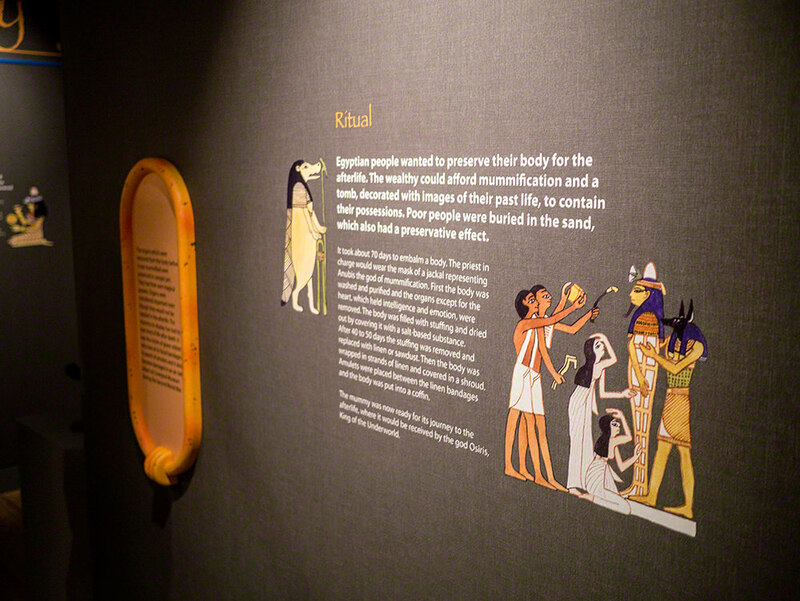 The walls are embellished with information panels, some of which have reproductions of Egyptian scenes. 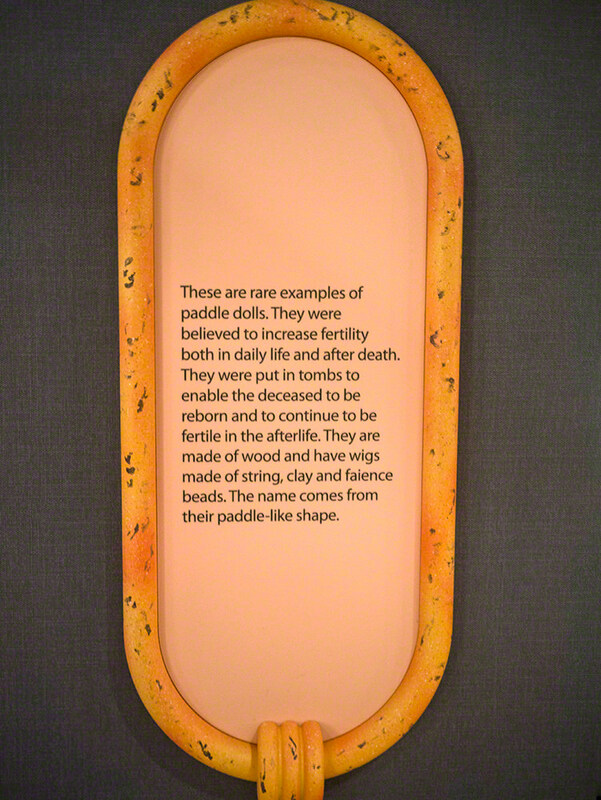 Other information panels are contained in cartouche-shaped frames. As well as being an excellent museum buddy, bringing my three-year-old along meant I could see how child-friendly the gallery is. 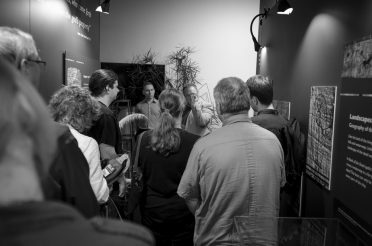 I was confident that the exhibition designers would have thought of the younger generation, as The Atkinson does put on a lot of events for children and families. 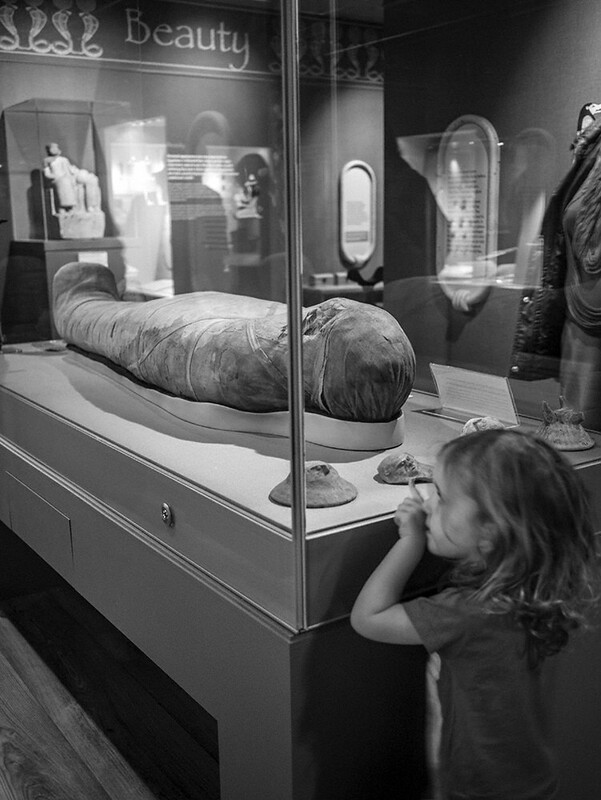 The display cases were set at a very reasonable height – being only a few inches out of reach for a three-year-old will mean they’re accessible for most children (and for visitors using wheelchairs). 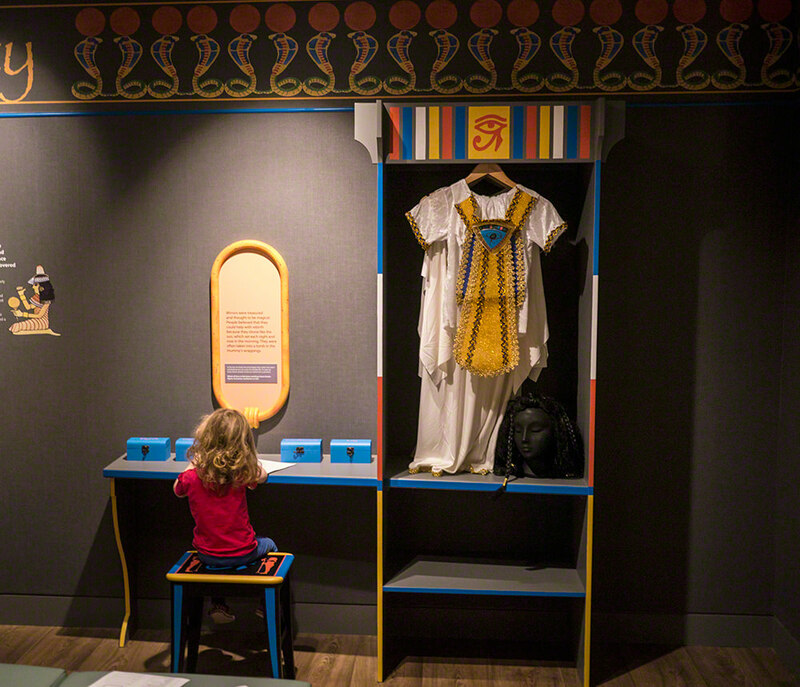 There is also a children’s corner, with a desk containing four different spices used in ancient Egypt to smell, colouring in and dressing up, including a rather fabulous lady’s wig. The pièce de résistance, however, is the interactive wall. The wall is beautifully constructed, with hieroglyphic inscriptions cut out and mirrors behind. 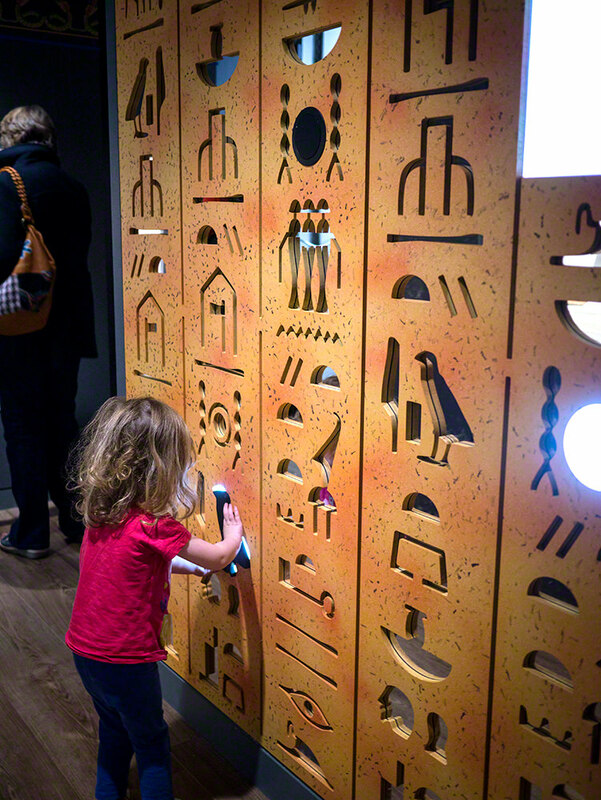 There are a handful of hieroglyphs which have the pieces to fit back in, and when you do, they set off audio and video pieces showing you information such as how the Egyptians put their eye makeup on. There are a lot of interesting and beautiful pieces on display. Here’s a selection for you to feast your eyes upon. The long panel belonged to a lady of unknown name; she was a Singer of Amun and Lady of the House (a title given to married women). The second panel is unusual in that it shows Horus overseeing the weighing of the heart instead of Anubis. Both pieces are from the 21st Dynasty. The paintwork and style of decoration look very similar on the two pieces; however, one or two differences, such as the friezes along the top make me think they don’t come from the same coffin. 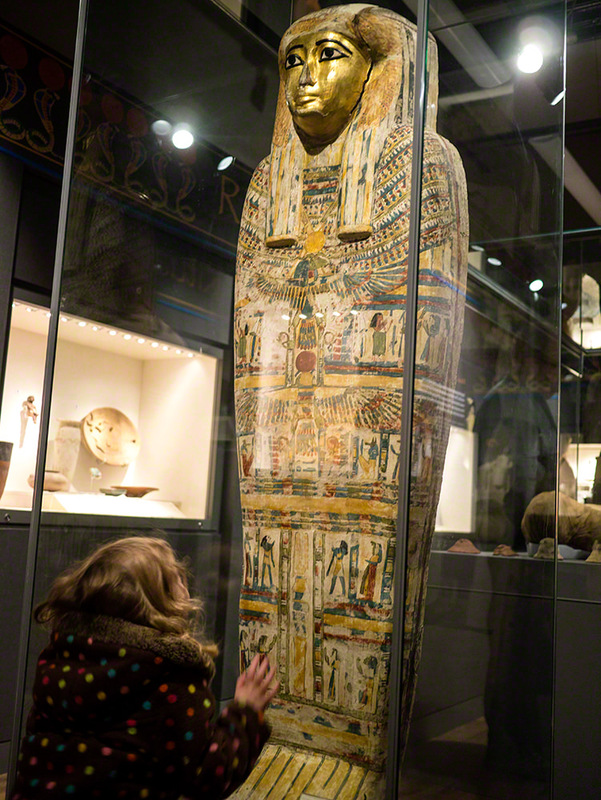 This coffin lid comes from Thebes and belonged to an unknown lady from the late 25th or early 26th Dynasty (the full-length photo is in the For the children section above). Two slightly more modern beetles (the scarab at the bottom). They still have the original handwritten labels. 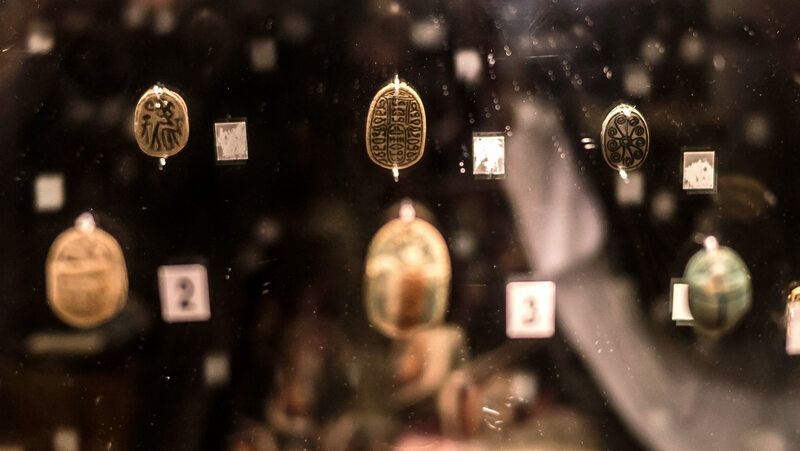 I really like how all these various amulets, scarabs and pieces of jewellery have been displayed in front of mirrors so we can see both sides of them. I won’t hesitate to say that I love the new gallery. It looks like a lot of thought has gone into it, and it’s wonderful to see such a lovely collection back out for us all to feast our eyes upon. 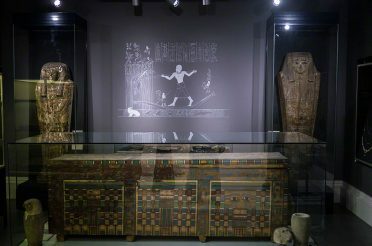 I particularly liked the information panels for the coffin fragments, which had reproductions of the decoration with the various gods, goddesses and people clearly labelled. 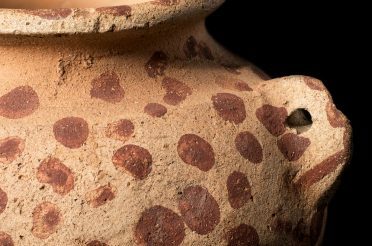 The only downside was that some of the information labels were scant on information, but I guess this may be because – as is often the case with pieces bought privately during the 19th century – they were found and sold on without a record of their provenance being made. Some of the other pieces had a lot of information, so I assume it’s that the information is missing, and not just having been omitted. They’ve made very good use of the relatively small space available and catered well for the younger generation as well as the more grown up. 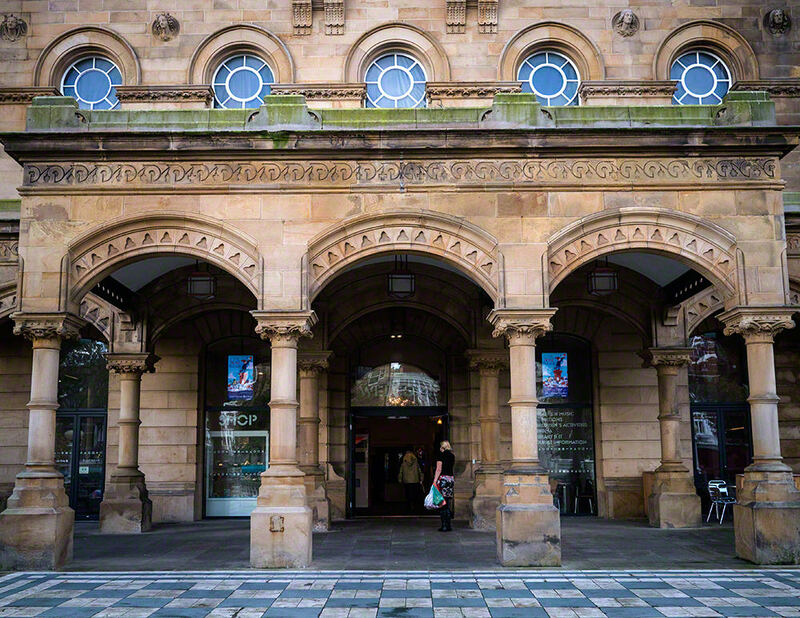 The Atkinson itself is an art centre, with temporary exhibitions, a theatre and lots of events. It’s well-serviced with facilities, including decent wheelchair access, a shop with locally made artwork (and now, of course, a good supply of Egypt-related goodies) and a very reasonably priced (and yummy) cafe. 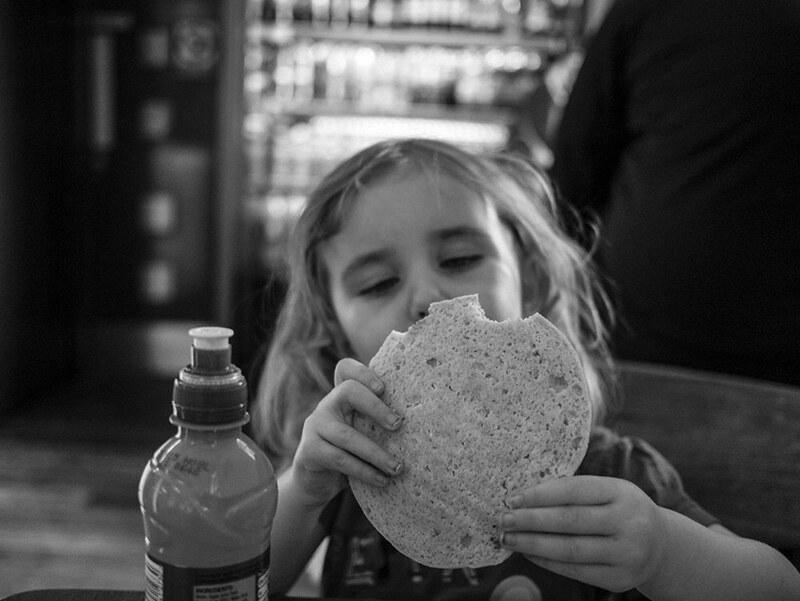 And who can complain when you can buy a cookie as big as your head?